Our new rooftop terrace is currently under construction until further notice and we hope to share this fresh and exciting space with you very soon. We apologize for the inconvenience and wish you a pleasant stay at our newly opened hotel in downtown Atlanta. Welcome to Home2 Suites by Hilton Atlanta Downtown a modern hotel with historic charm. Set on the edge of Centennial Olympic Park our hotel is a quick walk to government buildings and corporate offices and steps from World of Coca-Cola the CNN Center and Georgia Aquarium. Pro sports fans will love our location near the Georgia Dome for Falcons football and Philips Arena for Hawks basketball. Hartsfield-Jackson Airport /ATL/ is just 10 miles away. 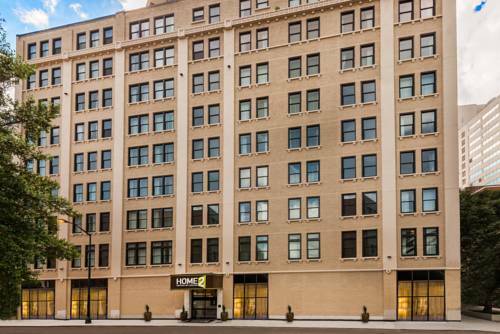 Opened in 1917 as an office building our new all-suite hotel retains its historic look and impressive architecture including terrazzo floors and marble stairs. Suites are quaint and smartly designed spaces with movable furniture a full kitchen ergonomic workspace a living area with HDTV and tall windows for gorgeous views of downtown. Check email with free WiFi and bring your pets along to our extended-stay hotel. Start the day right with a free Inspired Table breakfast including waffles oatmeal yogurt and breakfast sandwiches. Our unique Spin2Cycle fitness and guest laundry facility is open 24 hours run the washer while you run the treadmill. Unwind after a long day on our rooftop patio with endless views of the city. Our Atlanta hotel also has a Home2Mkt convenience shop 24-hour business center and meeting space for up to 30 guests.